Abstract Submission closes on April 25th. Early registration deadline is May 10th. SNEWS, the SuperNova Early Warning System (snews.bnl.gov), is an inter-experiment network with the aim of providing a prompt alert to the astronomical community of the observation of the burst of neutrinos from a nearby core-collapse supernova. SNEWS began in 1998 and has been operational in automated-output mode since 2005. Since that time, there has been remarkable evolution of the transient astronomy landscape. Gravitational wave detectors are now active, and there have been recent spectacular observations involving multiple wavelengths of electromagnetic radiation, neutrinos and gravitational waves. Community infrastructure for fast response to alerts has improved significantly and there are new opportunities available for rare and valuable gathering of scientific information in response to a detected neutrino burst. 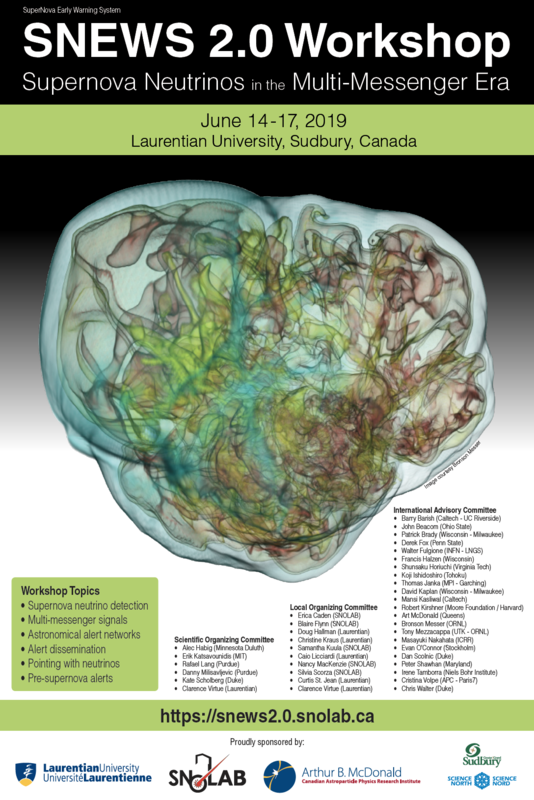 The “SNEWS 2.0” workshop will be held at Laurentian University, Sudbury, Canada, June 14-17, 2019. It will focus on plans for an update of SNEWS, given the new context of multi-messenger astronomy. The focus will be on real-time alert aspects of supernova neutrino detection. The workshop format will include invited talks, panel discussions, some talks selected from the contributed abstracts, and a poster session. Early-career community members are especially encouraged to attend. Details concerning travel bursaries for graduate students will be placed on the workshop website prior to opening of registration. Underground tours of SNOLAB will be available on both June 14th and 17th, but tour spots are limited to 30 per day. Signup for tours will be part of the online registration. On Thursday June 13th, a HALO-1kT collaboration meeting will also be held at Laurentian University. For further details please contact Clarence Virtue (cjv@snolab.ca).